How does all this relate to Obamacare? One key feature of Obamacare is that it gets rid of the free-for-all individual health insurance market, and requires all health insurers to meet some very standardized criteria (accept applicants regardless of health status, minimum coverage levels, etc.). It also requires some of the key features of the plans to be easily summarizable on a comparative table that consumers can use when choosing a plan. In other words, it sacrifices flexibility for stability and predictability. There will be less variety of health insurance plans out there. A highly informed consumer may no longer be able to get some very specific plan that might have been available before. But, for the average consumer, things will be easier to understand, and it will be easier to make a good choice. Many Americans tend to believe that more choice is always better. But choice comes with costs: it takes energy and time to make a choice. We need good information. Many of the choices might almost never be the right one, but we still need to take the time to know that. Evo-Devo is a form of proof that more choice is not always better – evolution is a pretty hard-nosed force, choosing the most efficient form. And evolution has clearly made the choice to have less choice. Predictability and stability trump freedom in this case. Of course, these are not black-and-white questions. Current developmental patterns do keep some flexibility, just as Obamacare does preserve some consumer choice. The optimal balance between the two will vary case-by-case. We can also take the analogy one step further. Consumer choice can be thought of as a process like natural selection, weeding out the worse plans. Regulations on what plans can be offered are like Evo-Devo constraints (gene regulatory networks, canalization, compartmentalization). Before Obamacare, consumers were making their choice among many diverse plans with little in common. Now, they will make a more directed set of choices. And longer-term, they will also make another choice (as voters): to continue with Obamacare, or to revert to a free-for-all market. This longer-term choice is like natural selection on species and lineages rather than individuals. It does an individual no good to be the strongest and the best-reproducing member of an entire species that is doomed to extinction because it cannot evolve to changing conditions. So we will see, in the years to come, how well my analogy holds up: will consumers prefer the predictability and stability of choice offered by Obamacare, or will they revert to a preference for flexibility? Your entire analogy is ludicrous. 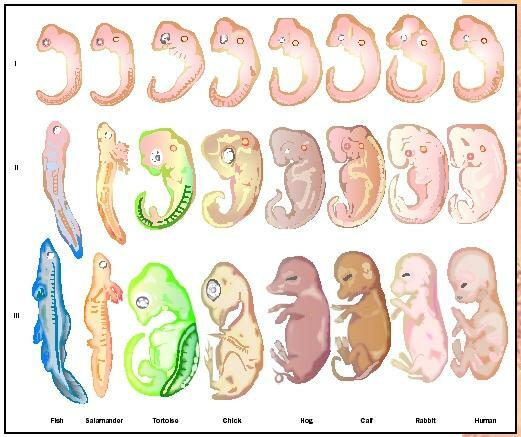 Body forms are not standardized by evolution, tetrapod limbs work for many species simply because they’re good enough for the animal to survive the environment they’re in long enough to reproduce. That’s it. To compare evolution, which is a completely random meeting between genetics and the external environment, with a non-random process like government policy is pretty damn stupid. Not sure why you’re so combative. Do you have a background in evolutionary biology? I disagree that evolution is a random meeting between genetics and the external environment. There is randomness (genetic drift, random environmental fluctuations, etc.) but there is also structure, produced by natural selection and evolutionary constraints. In fact, because drift tends to average out over the long term, it is possible to see macroevolutionary patterns largely as a balance between selection and constraints. The idea that we can’t make analogies to humans systems seems strange to me. Economic systems are also a balance between selection (market forces) and constraints (regulations, availability of transport networks, etc.). I am far from the first one to make this parallel – in fact, my Ph.D supervisor’s well-known textbook on ecology is called The Economy of Nature.